Show will “celebrate the music, often surreal imagery and humor synonymous with Frank," promises Ahmet Zappa. Live music hologram production company Eyellusion has announced "The Bizarre World of Frank Zappa" hologram tour, which will kick off April 19 at the Capitol Theater in Port Chester, New York. The story behind the upcoming shows is as follows: In 1974, Zappa transformed his Los Angeles rehearsal space into a sound stage and cranked out some unbelievable performances seen and heard only by the camera operators in the room. The audio from these performances—locked away in the Zappa vaults for 44 years—will serve as the basis for what will be the world's most ambitious hologram tour to date. The "can't miss" concert spectacle is being produced in close cooperation with the Zappa Family Trust. The "Bizarre World of Frank Zappa" hologram tour band is comprised of former Zappa bandmates. The touring unit boasts guitarists Ray White and Mike Keneally, bassist Scott Thunes, multi-instrumentalist Robert Martin, percussionist Ed Mann, and drummer and Zappa archivist Joe "Vaultmeister" Travers. 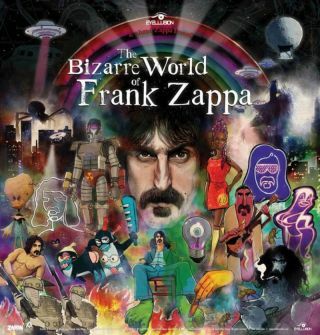 Said Ahmet Zappa, EVP of business development for Eyellusion and co-trustee of the Zappa Family Trust: "As a futurist, and hologram enthusiast, Frank fearlessly broke through boundary after boundary as an artist and in honouring his indomitable spirit, we're about to do it again, 25 years after his passing. Ahmet continued: "My father and I actively discussed 3D and 'holography' and it was a concept he actively engaged in. He actually devoted half a chapter of his The Real Frank Zappa Book to this subject. This is a love letter and a journey celebrating the genius artistry of Frank Zappa. On a personal note, I feel like I am finishing something my father started years ago. And let's not forget, Frank himself will be rocking his fans, alongside his bandmates like nobody's business." Tickets for the U.S. shows go on sale Friday, February 15 at 10:00 AM (ET) at all major ticketing outlets, with a special VIP pre-sale launching on Wednesday, February 13. For more information, head over to Zappa.com.